As the world's largest family of luxury hotels, we all take great pride in being genuine ambassadors of the InterContinental® brand.Shaped by decades of international know-how and local insights, our passion for luxury travel spans cultures and customs. Inspiring us to create warm and sophisticated experiences for those seeking a richer perspective on the world. Each of our hotels cultivates a distinctive style and ambience where we embrace every opportunity to give our guests a personal and enriching experience. If you'd like to embrace a wider world of experiences and opportunities, we'd like to welcome you to the world's most international luxury hotel brand. The avant-garde InterContinental Genève embodies the refreshing, elevated perspective on luxury art de vivre in the world’s City of Peace. Maintain and improve the quality of the guest service within our Restaurants, Bars and Room Service according to our Standard Operating Procedures. Help the team during the service to provide the best experience possible to our guests. Manage and follow up any guest complaints. Manage and train the team of the Restaurants, Bars and Room Service. Prepare for your outlets the budgets, business plan and objectives with the Deputy General Manager. Ensure the follow up and provide the analysis of the productivity, the turn over, the number of covers. Participate to the elaboration of the menus, the presentation of the buffet and the advertisement on our F&B activities. Coordinate the reservations in all our outlets and set up and follow up all our data bases. With a Higher Degree of Education in Hospitality, you have a significant experience (5 years at least) in a similar position within a hotel with the same category and capacity (more than 300 rooms). You have a senior experience in a all-day dining restaurant and wish to keep your experience in the operations. You are mandatorily fluent in English and French. Mastering a third foreign language of one of our target markets (Germany, China, India, Italy, Middle East, Netherlands, Spain, Russia) is highly desirable. At ease with IT tools, you previously worked with Simphony. Thanks to an excellent relationship and management, you are acknowledged for the quality and the personalization of your service. You like working in a fast-paced environment and are autonomous, well-organized and flexible. You are accurate in your work and result-oriented. You aim to share your passion and knowledge with your guests and your colleague and are willing to help when needed. This position is to be filled as soon as possible. The position is opened to Swiss citizens and EU passport holders. We’ll reward all your hard work with a great salary and benefits – including a great room discount and superb training. Join us and you’ll become part of the global IHG family – and like all families, all our individual team members share some winning characteristics. As a team, we work better together – we trust and support each other, we do the right thing and we welcome different perspectives. You need to show us you care: that you notice the little things that make a difference to guests as well as always looking for ways to improve. Visit www.http://careers.ihg.com to find out more about us and apply, or send us your application to career.gvaha@ihg.com. InterContinental Hotels & Resorts® is looking for people who are charming, confident, sophisticated and with an international spirit, who do their utmost to exceed customer expectations. We thank you for your interest in InterContinental Genève and appreciate the trust you have placed in our brand. We acknowledge receipt of your file and documents. We will study your profile with the greatest attention and we will take the initiative to contact you if it matches our selection criteria. If we do not reply within 15 days, you may consider your application as not selected, according to the required prerequisites. However, we invite you to regularly consult all IHG offers and register at www.careers.ihg.com, and thank you for your interest in our group. IMPORTANT: please do not contact Journal des Palaces for questions regarding the offers, especially to know what happened to your application. We thank you for contacting directly the establishment. 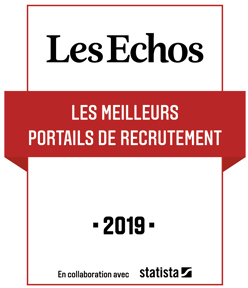 Our career section has been selected among the best job boards in Les Échos - Statista 2019 list: we are among the 8 best specialised websites according to recruiting managers and we are the only one dedicated to hospitality out of 50 websites. We would like to thank and share this trophy with ultra-luxury and luxury hotels, candidates and recruiters who continually encourage us to even greater excellence. Journal des Palaces' Careers Section post job offers in ultra-luxury and luxury hotels and gourmet restaurants worldwide and provide a complete toolbox to follow the applications: job alerts, application notebook, job notebook, files, newsletter... to guide you, whether you are actively seeking a new job or just on standby.